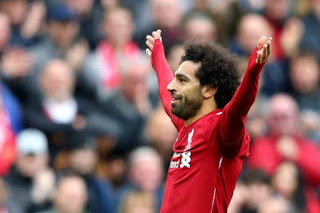 Liverpool returned to the top of the Premier League with a composed display at Anfield that sent Bournemouth to an eighth successive away defeat. Three days after Manchester City moved top on goal difference, Jurgen Klopp’s side responded to talk of the pressure of a title race showing in their performances in emphatic style. After a fairly cagey opening which saw Ryan Fraser test Liverpool goalkeeper Alisson, Sadio Mane settled any nerves by powerfully heading home James Milner’s cross. Mane looked fractionally offside but the finish means he has scored in four successive Premier League games for the first time in his career. Georginio Wijnaldum had not been allowed to stay in the Liverpool hotel on Friday because of illness but he was in fine form, doubling the lead with a sublime lob over the helpless Artur Boruc. Moments after the break, Naby Keita and Roberto Firmino combined in a move Klopp hailed “world class” to present Mohamed Salah with a simple finish from 10 yards, his 20th goal in all competitions this season.